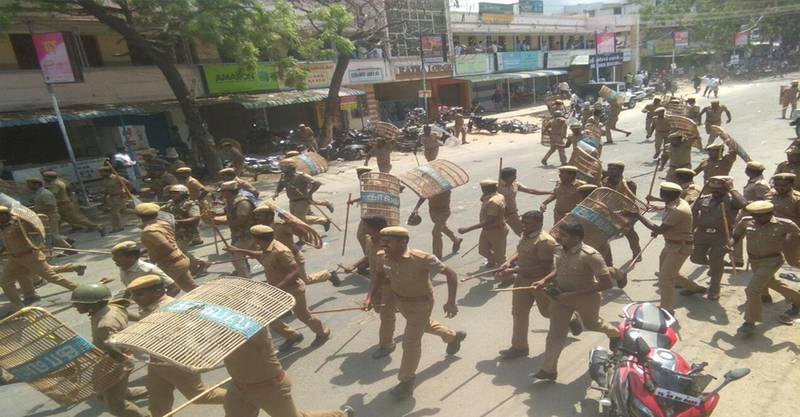 10 people were killed in in Thoothukudi when police fired at hundreds of protesters marching against a copper smelting plant of Vedanta and marched to district collectors office. Protesters who blame the Vedanta group’s Sterlite plant for health problems and depleting water allegedly set vehicles on fire and stoned policemen in Thoothukudi, which was formerly known as Tuticorin. An agitation against the factory started 100 days ago and took a violent turn after protesters learnt of the company’s plans to expand the four lakh tonne per annum plant. “I was grieved to know nine persons were unfortunately killed in this incident,” said Tamil Nadu chief minister Edappadi K Palaniswami in a statement. “The police had to take action under unavoidable circumstances to protect public life and property as the protesters resorted to repeated violence… police had to control the violence,” he said. DMK working president M K Stalin accused the police of atrocities and Tamil movie superstars Kamal Haasan and Rajinikanth, who recently entered politics, expressed solidarity with the protesters. “The expansion (of Sterlite Copper) should not at all be allowed. If possible, it will be good to close down the (existing) unit,” said Makkal Neethi Mayyam chief Kamal Haasan. “One can’t understand why the government, which gave the nod for the plant, is not taking any action and is just watching,” said Rajinikanth. Congress president Rahul Gandhi called the deaths of the nine people state sponsored terrorism. The Tamil Nadu government in a statement said that the Sterlite plant is more than 20 years old but in 2013 the then Chief Minister J Jayalalithaa had it shut down after people complained of irritation in their eyes. It said in March, the company had applied for removal of consent to operate (CTO) for its existing smelter plant. The application was rejected after the state pollution control board found that the factory has not fulfilled some of the major factors including non-submission of a detailed ground water analysis, action not taken to dispose waste and not building a compound wall to arrest water mixing in the nearby river.